So far Volleyball2012 has created 4 blog entries. Former VbDC camper Alejandro Losada, who hails from Ludo, Spain, near Santiago de Compostella, has been given more court time than usual for a freshman, as he wraps up his first year as a member of the Wittenberg University men’s varsity team in Springfield, Ohio. Losada took part in 42 sets in 21 matches of the mens’ 25-game season, and put six services aces, two blocks and 16 points on his personal scoresheet. Most first-year athletes spend the majority of their introductory season on the bench while they learn the college’s playing style. The Tigers had 17 men on this year’s squad, and finished their season in the NCAA Division III North Coast Atlantic Conference with a 14-11 record. Hannah Carey, former VbDC camper and coach, has stayed on in the US after completing her bachelor’s degree at Missouri Baptist University in St. Louis, where she played volleyball for four years under a full ride scholarship, and won All-American honours in her final year as an undergraduate. Receipt of a degree normally concludes an athlete’s career at a US university, but Carey’s performance at the school was so impressive – she also took part in the first conference beach tournament in her final semester, and took fourth place – that the university offer her a fifth year under scholarship to study for her masters degree in sports management, as an assistant in the school’s successful volleyball program. Jess Grimson, who decided to devote her sports career to volleyball after attending a VbDC camp, reached the quarter finals of the beach volleyball competition at the 2018 Gold Coast Commonwealth Games with her partner Vicki Palmer. Grimson attended one of the first VbDC camps as a teenager, when she was being courted by a US university to play football. Active in a variety of sports, Grimson had also taken a serious interest in volleyball and was undecided which of the two sports she wanted to focus on. Years later, as a guest speaker at a VbDC Elite Camp, she told her audience that her experience at the camp had been a factor in her decision to concentrate on the court game, which eventually led to her move to sand. 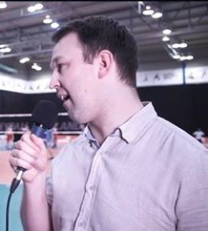 VbDC’s head coach for the 2018 Elite Camp, Luke Thomas, has teamed up with former England juniors coach Carol Gordon, who has also coached a VbDC camp, to become commentators for Volleyball England’s web streaming of games and tournaments. They made their debut in Kettering, Northamptonshire on the final day of the National Junior Championships, and feedback on their game analysis was sufficiently positive for them to be invited back to do further work in future streaming. Their first effort at commentating was made technically smoother than the experience another team of anchors had on the previous day, after repairs were made to a breakdown in the audio link which had interrupted the new streaming service. But their ability to present as a team was due to work that began many years before: Gordon was Thomas’s coach when he was a member of the England Cadet squad from 2000 to 2002.